Sen. Bernie Sanders of Vermont says President Donald Trump should "go back to the drawing board" on the U.S.-Mexico-Canada trade accord because it would let Michigan-based General Motors and other companies send U.S. jobs to Mexico. 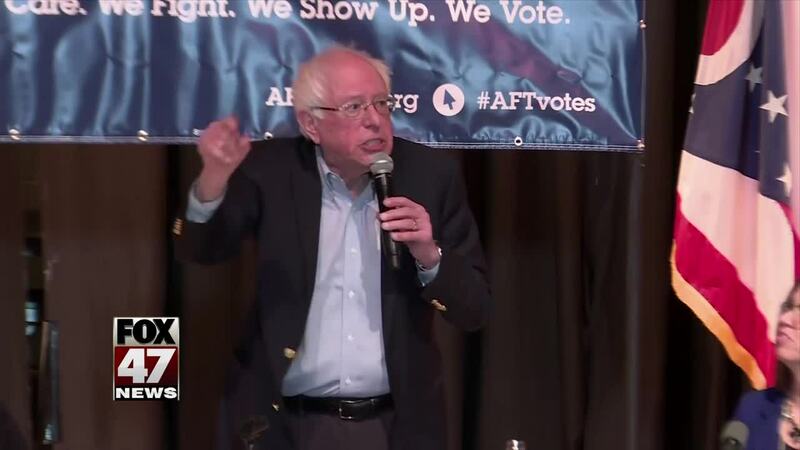 WARREN, Mich. (AP) — Sen. Bernie Sanders of Vermont says President Donald Trump should "go back to the drawing board" on the U.S.-Mexico-Canada trade accord because it would let Michigan-based General Motors and other companies send U.S. jobs to Mexico. The Democratic presidential candidate rallied in the working-class Detroit suburb of Warren Saturday night, after earlier speaking at a union hall in Coopersville outside Grand Rapids during a swing through Midwest states. Sanders says Trump shouldn't send the trade agreement to Congress unless it has enforcement mechanisms to raises workers' wages and to prevent corporations from outsourcing jobs. The tentative agreement is intended to replace the North American Free Trade Agreement, but its fate is uncertain. Sanders says Trump's "biggest lie" to voters in 2016 was that he's on the side of the working class.